Pool coping is a material that is installed to finish the top edge of the pool. For several years, precast concrete with a bullnose front edge has been the standard pool coping. These days, modern pool designs are making greater use of natural stone coping. This is an increasingly popular decision as it gives the owner many more choices when it comes to texture, color scheme, and materials. At Modern Stone Care we specialize in cleaning, restoring, polishing, and sealing natural stone surfaces; this includes your outdoor pool coping tiles and pieces. We work hard to ensure your natural stone maintains its beautiful appearance for as long as possible. Outdoor natural stone takes a beating in the sun yearlong, and especially during the summertime. When there are people jumping in and out of a chemically treated pool they cannot help but to track the treated water onto the stone surfaces. 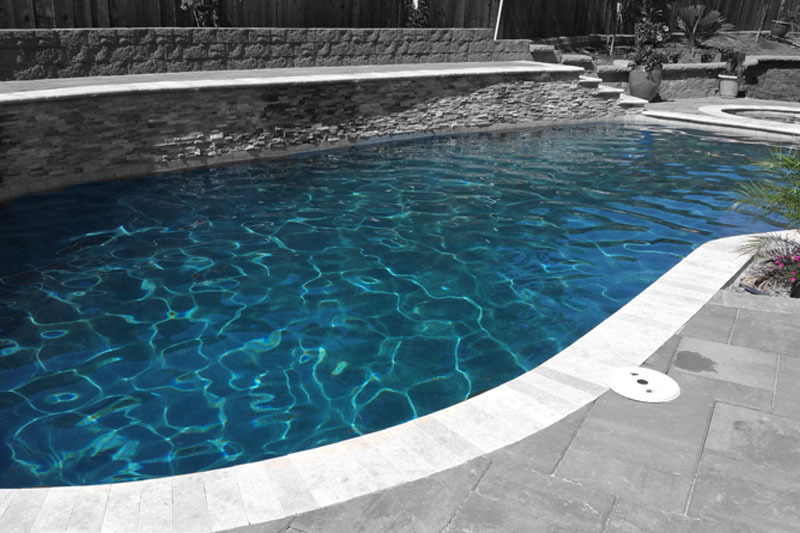 Chlorine and other chemicals found inside of many pools is harsh, and can break down the stone. This is why it is vital for those with natural stone pool coping to have professional stone care treatments performed on their stone. You will need to seal your natural stone regularly in order to keep a strong protective barrier between the chlorine and tiles. Depending on the condition of your natural stone you may need further treatment services in order to protect and preserve your stone.